Every scar on your body tells a story. Stretch marks from pregnancy or weight gain, other life events such as a cesarean delivery, surgery, or injury can leave tell-tale scars behind. Dr. Marcia Hartt Medical Aesthetics offers several medical aesthetic treatments that reduce the appearance of your scars and make the story telling optional. Different kinds of scars do not all respond to the same treatment. Pigmented scars are most often treated with Intense Pulsed Light Therapy. Pulsed light technology targets and applies light to the discolored areas, which coagulates the blood vessel and breaks the pigmented lesion into tiny particles; these then disappear or rise to the surface of the skin as scabs, which are naturally exfoliated within one to two weeks. Other modalities can also treat pigmented scars, such as medical grade skin care, SilkPeel Dermalinfusion Microdermabrasion, medical facials, chemical peels, InfraRed (IR) Skin Tightening Laser, and Erbium Fractional Laser treatments. Indented or depressed scars affect the texture of your skin and are harder to treat. Deep indented scars are best treated with dermal fillers. Shallow depressions can be treated with Erbium Fractional Laser treatments, subcision or aggressive microneedling. Each of these treatments helps to build new collagen in the skin, which improves the texture and gives the skin a smoother surface. A combination of laser treatments and dermal filling CAN make any of these scar types appear less noticeable by giving the skin a more uniform colour and a smoother texture. 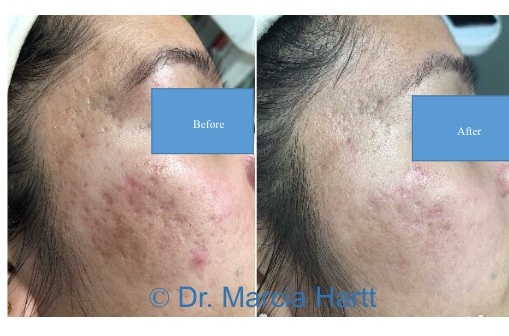 As results vary depending on the severity of the scar, booking a free consultation with Dr. Marcia Hartt’s team will help you understand the best scar treatment options available for you and the results you can expect.